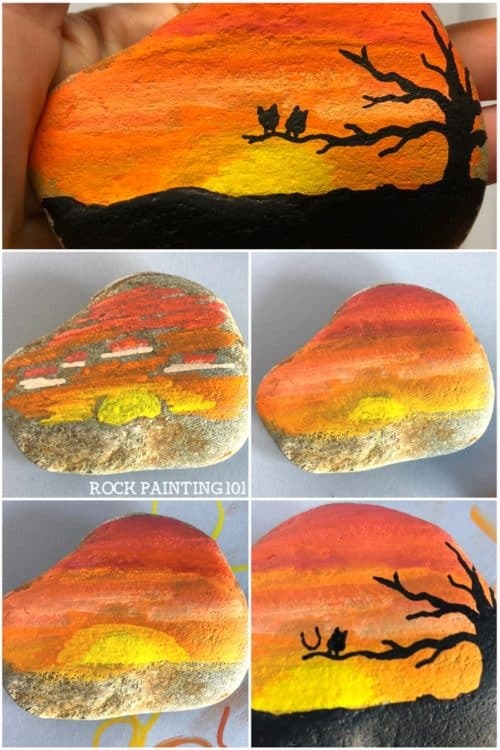 This bright and beautiful orange sunset rock is made with some simple paint blending and a black tree to give it some character. I’m going to call this a sunrise rock because it’s bright and early here. 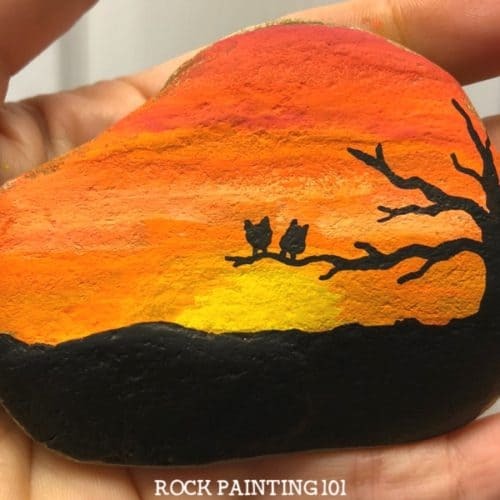 I’ve made several sunset rocks before and a reader requested that I paint an orange colored blended sunset. I love the cute little owls that are watching the sunset. 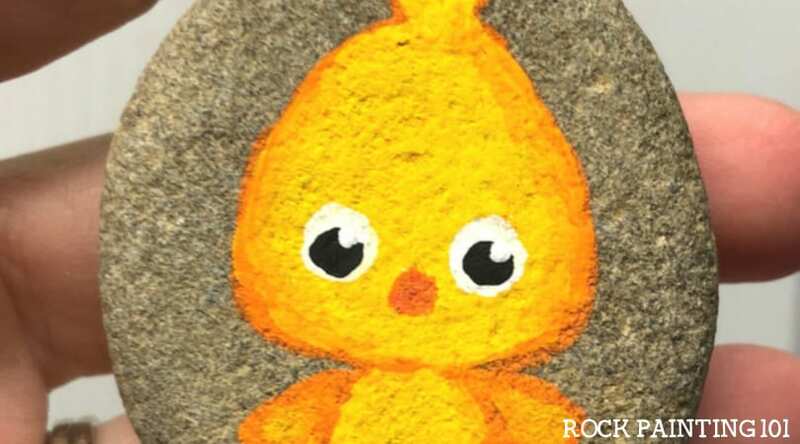 Plus I love how easy this rock painting idea is, even though it looks difficult. Check out the fun dotted sunset that I created! Blending a sunrise painted rock! You can grab the Posca pens that I used on this sunset rock here. Start with a half circle for your sun. That way you can add several coats to make it stand out. Next, sketch in your sunrise colors: orange, dark orange, and red. I added a little peach to create some clouds in my sunset. If you don’t have a base coat on your rocks, you may need to give this a second coat. Let your first go of the colors dry and then start the second coat. This time you can start blending your colors a little. Grab a lightly dampened paintbrush and lightly blend your colors together and blend your clouds into the sunset. 101 Tip! : If you’re having trouble blending your colors, make sure that there isn’t too much water on your paint brush or that you’re not pushing too hard with it. The lighter the better. Now paint the bottom half of your rock with black paint to create the ground. To paint the tree silhouette in front of your sunset, I like to start with the tips of the branches and paint into a trunk. With each branch, the trunk will become thicker. Once your tree is the way you like it, add a couple of owls. Because you know they are going to enjoy the view of this beautiful sunrise rock. If you create one of these sunsets, please share it with us!! Leave a picture in the comments of our Facebook Live! 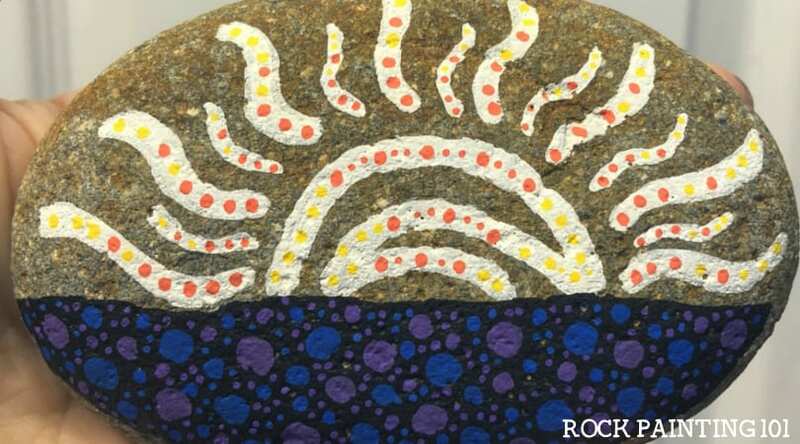 This sunset painted rock was inspired by our #52Rocks! challenge where we are painting a different theme each week! Follow along here!